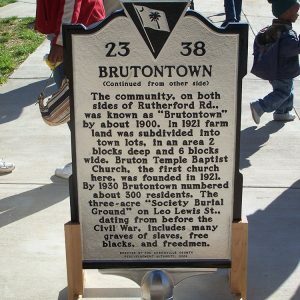 This is a historic African American community founded by Benjamin Bruton, a mulatto Freedman in 1874. He built a house and blacksmith shop. Others — a few of them tradesmen like Bruton, but most tenant farmers — soon moved to this area. By 1880 there were 60 African American families in the area. By 1921, the community had its first church, Bruton Temple Baptist Church. The antebellum three-acre “Society Burial Ground” includes many graves of slaves, free blacks, and Freedmen. Marker erected by the Greenville County Redevelopment Authority, 2009.